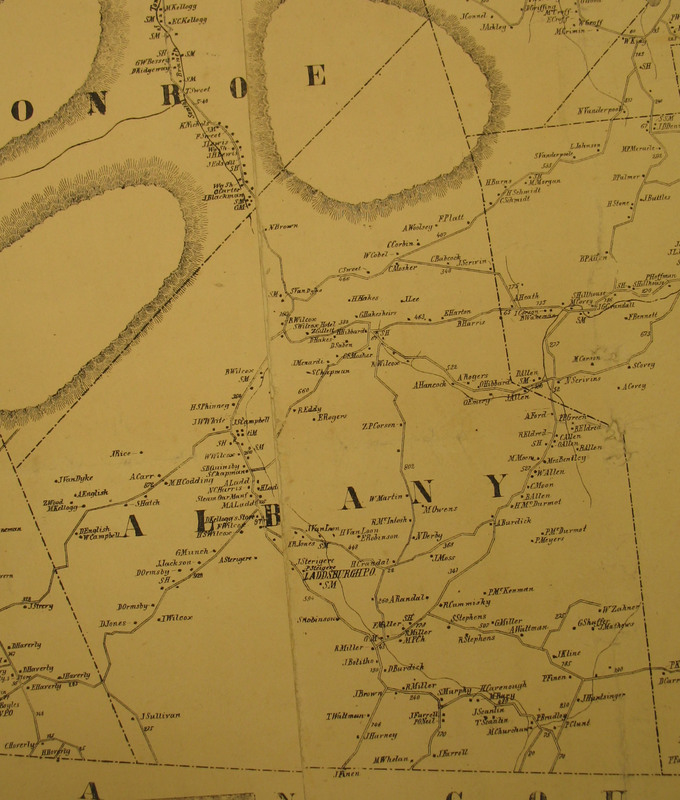 Albany Township was established in 1824 from Asylum Township to the north. Albany Twp. is situated along the extreme southern border of Bradford County with Sullivan County. The land is hilly but not mountainous making for good farming conditions. The primary community in the township is called New Albany. In 1853 the township lines were re-drawn to create Overton Township from the western portion of the town, making Albany Township smaller. It is bordered by Overton Township to the southwest, Monroe Township to the northwest, Asylum Township to the northeast, present-day Terry Township and Wilmot Township to the east. In 1858, Albany Township had five (5) school houses and two saw mills. The Wilcox Hotel and the Steam Oar Manufacturing company were also found in the township. The township also had a Methodist Protestant Church established as well. The residents have been sorted alphabetically by name to allow quick searching. No attempt has been made to combine names associated with multiple properties. If a person is listed with 2 or 3 properties the name will appear that many times in the list. In this way the transcription makes no assumption about whether the same person owned several properties or several residents had the same name. Remember: These are only landowners; any renters were not listed on the map. Updated 24 Jan 2015 using AncestorTracks.com scan of Albany Township (image). Bentley Mrs. Lydia Husband was probably “B. R. Bentley” from the 1850 census. Campbell J. S. John S.
Crandal H. Hiram Name also spelled “Crandall” in census. Ford A. A. G. D.
Green P. P. Paul P.
Hibbard O. Orison Name also spelled “Hubbard” in census. McKenman P. Peter Name might also be spelled “McKenna”. Mosher C. Name also spelled “Moshier” in the census. Mosher C. S. Name also spelled “Moshier” in the census. Randal A. Amos B. Name also spelled “Randall” in the census. Wilcox H. S. Hiram S.
These names were found using the 1850 and 1850 census for this town. IT IS A GUESS but an attempt at helping you identify your ancestor. Please contact me if you can confirm a name or know it is different. January 24, 2015: The township list was updated using a better image posted by Ancestor Tracks. Possible Name and additional notes were also added during this update. August 23, 2002: This transcription has been updated with corrections and omissions identified by Bob Sweeney, Sullivan County Historian for Rootsweb. Many thanks to Mr. Sweeney for taking the time to review the Albany, Overton, and Wilmot township maps and providing corrections and omissions from my original transcription.